There are specific applications which require measurement tools with very low frequency response recording capability. The Lansmont Saver 3D15 was designed specifically for low frequency recording. For instance, amusement park rides, aerospace flight applications, rail-car coupling impacts, and vehicle crash testing applications all possess unique dynamic characteristics; low frequency response, long duration, constant acceleration. Instruments using hardware/accelerometers with DC-response are best suited to accurately and precisely measure these low frequency, long duration dynamics. 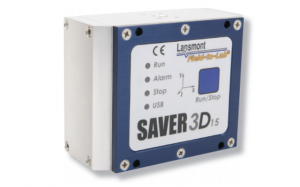 The Lansmont Saver 3D15 is our first instrument to use MEMS technology accelerometers, possessing DC-response measurement capability. The 3D15 uses the identical chassis and casing as Lansmont’s industry leading measurement instrument, the 3X90. Traditionally, the power requirement for DC-response hardware has limited their field applications, however Lansmont’s innovative design allows for fifteen (15) days of continuous run time on one set of batteries.